Arlington will soon see even more dockless electric scooters cropping up on its streets, but officials remain a bit vexed about the best way to keep underage riders off the vehicles. While county transportation officials say they haven’t seen any major safety issues with the scooters beyond a handful of accidents, they also told the County Board Tuesday that the community response to the pilot program expanding the number of dockless vehicles in Arlington has been far from unanimously positive. In all, county commuter services bureau chief Jim Larsen told the Board that his department has received 550 scooter-related complaints from Oct. 1 through Nov. 19. Most of those have centered around people riding scooters on county sidewalks or trails, a practice banned by the county’s pilot program, or teenagers riding scooters in violation of company rules. 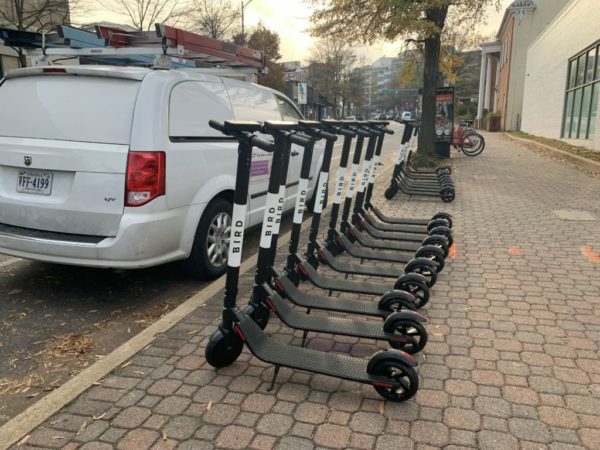 Both of the scooter companies currently operating in Arlington — Bird and Lime — ban anyone under the age of 18 from riding the vehicles, and require users to submit a photo of a driver’s license before riding. Nevertheless, Larsen says the county isn’t quite sure how to tackle the latter issue, in particular. The whole point of the pilot program, which is set to run through July, is to test out the best policies for the county to adopt surrounding the scooters. And nearly two months in, after the scooters recorded nearly 69,200 rides in the month of October alone, Larsen says there are still more questions than answers. But even when a police officer or teacher catches an underage rider on a scooter, Larsen noted that there’s not much they can do about it. After all, he points out that state law actually allows anyone 14 or over to ride a motorized scooter, though the definition of what constitutes a scooter has certainly changed drastically since the law was written. Yet, with so little of the pilot completed, county officials are hesitant to ask Arlington’s General Assembly delegation for too many changes just yet. They’re also wary of a repeat of the way the state chose to regulate ride-sharing companies, removing control from localities in favor of a light-touch regulatory scheme managed by state officials. “Our goal is to craft common sense regulations coordinated across localities, but ones that preserve that ability to maintain that regulation on the local level,” said county transportation chief Dennis Leach. Larsen would caution, however, that Bird and Lime have already both hired lobbyists in Richmond to make their case to lawmakers, so the county will need to have some answers by the time the legislature reconvenes in January. To that end, he suggested convening interested county staffers, including Arlington’s legislative liaisons, in a working group to focus on the issue. There will certainly be plenty of pressure to act fast — Larsen says Lyft is nearly finished with the application process to offer its scooters in the county, and a dockless electric bike company could offer its wares on Arlington streets by January. But policymakers do have one factor working in their favor as they work to craft solutions; it’s no longer the ideal temperature for scooter-riding.